We all know that advertising plays a key role in promoting any business. 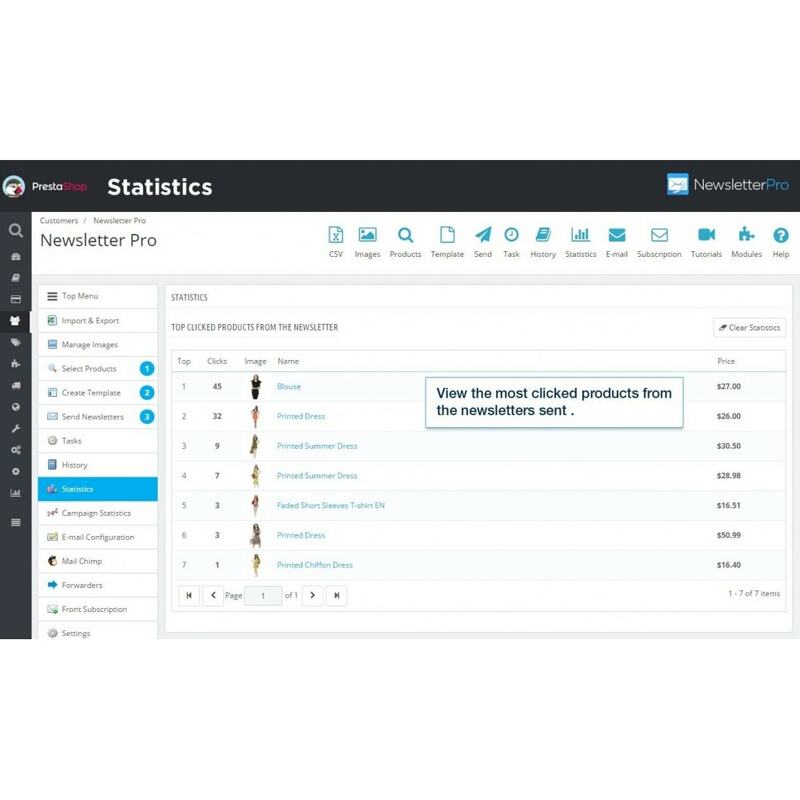 Using our newsletter will boost your sales faster and easier than any other newsletter module available on the market. 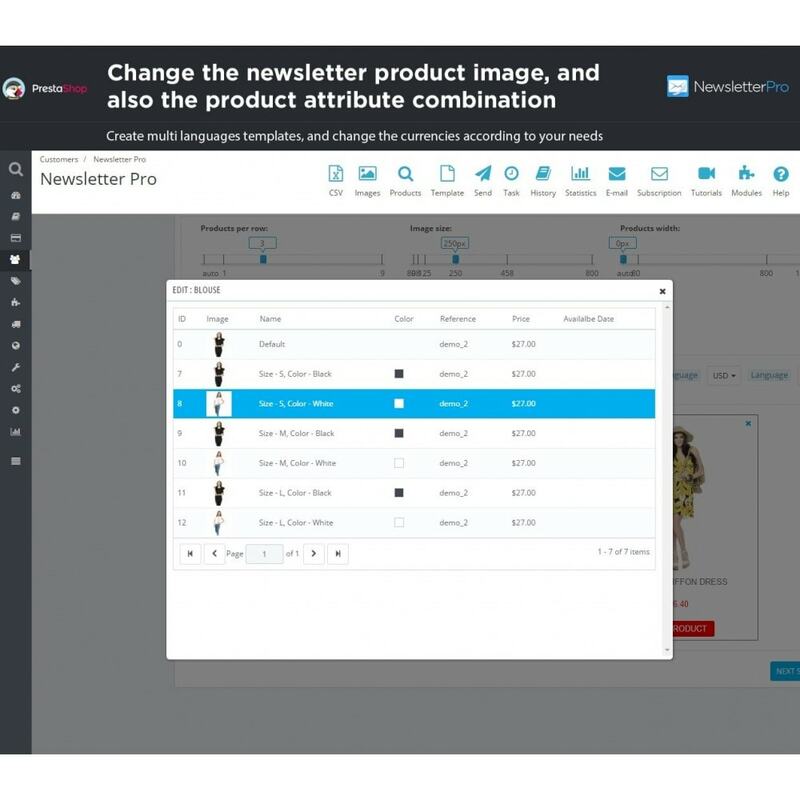 This module is an easy and fast way to send customizable newsletters about top selling products or special offers to your clients. If you want a detailed list of features, or if you have some questions regards this module, please contact the developer via the prestashop form. 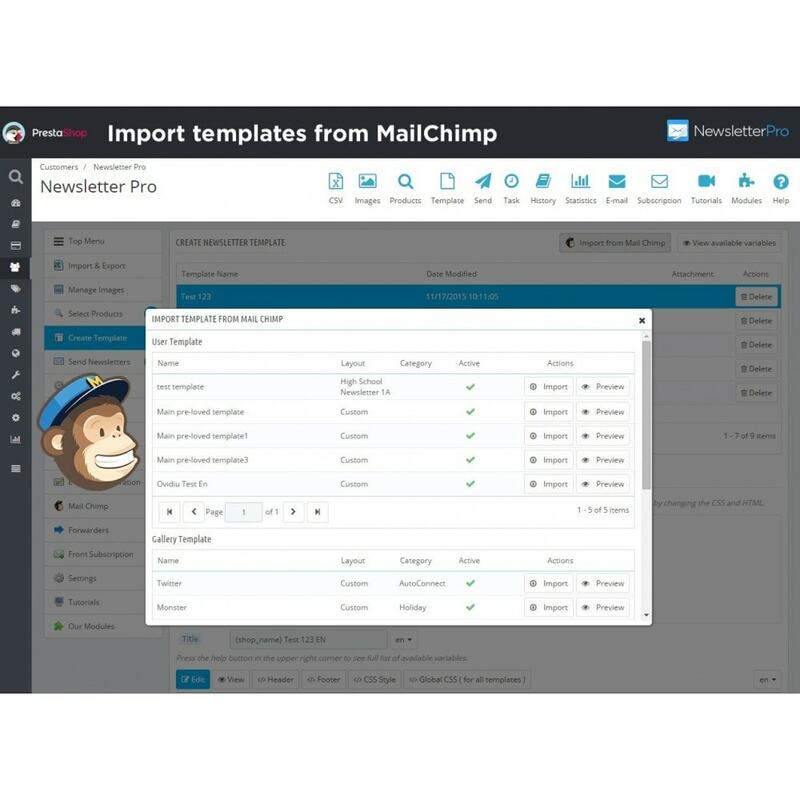 Working with MailChimp (synchronization, import and export templates). Allow customers to subscribe to a specific category from the shop. 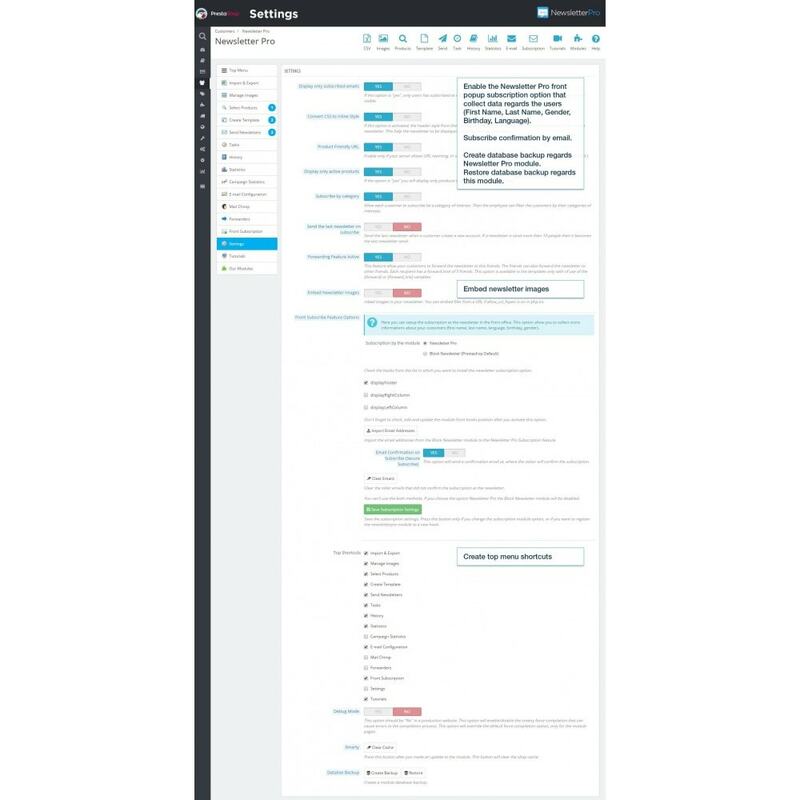 Allow users to subscribe at your newsletter from the website front-office.Collect more data about your users like: First Name, Last Name, Gender, Language and Birthday. You can create a list of interests that allow users to choose different options when they want to subscribe to the newsletter. Later all this information can be filtered by you from the back-office. Easily add products from your store (image, name, price, short description, etc.). You can select the language and the currency in which the products are to appear in a newsletter. 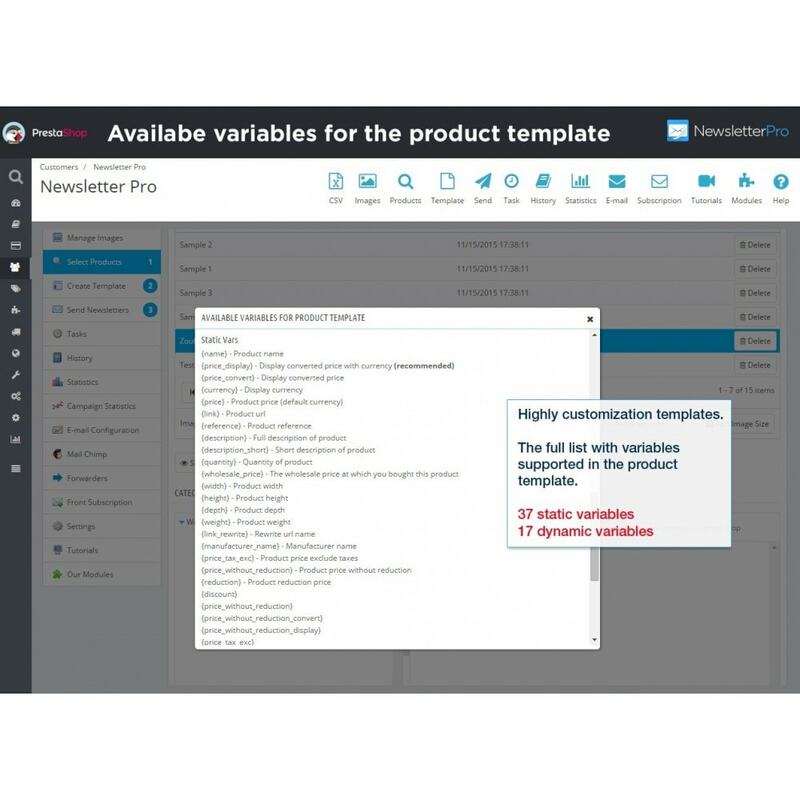 Insert selected products into a new template. The possibility of sorting the products (price, name, discount) before inserting them into the newsletter. Choose a different product currency for a different language. 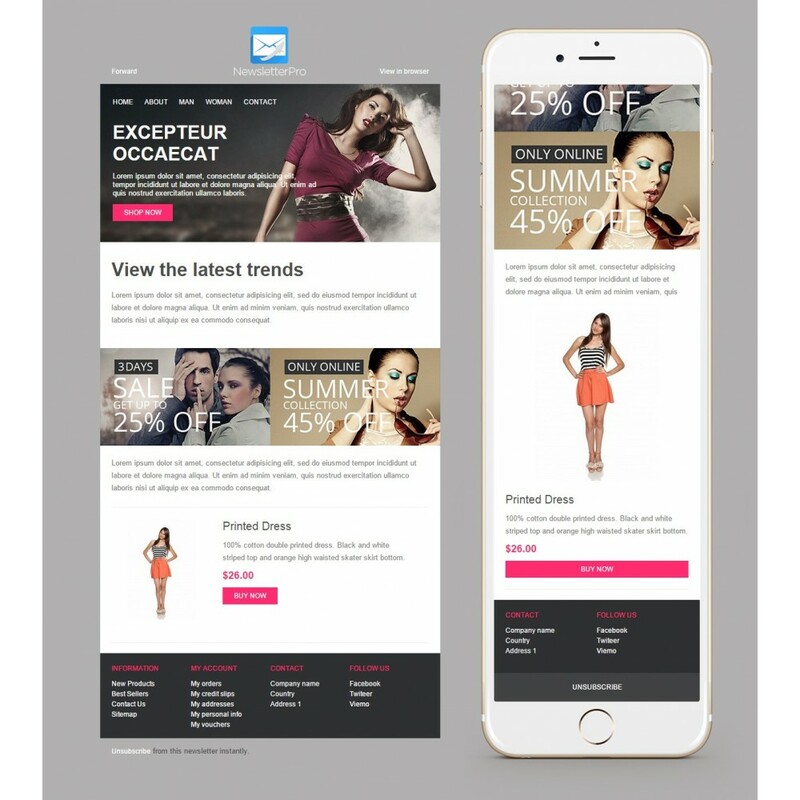 Create a newsletter template with the selected products from your store. Change in real time the template width, template background color, products background color, links color, products name color. Modify CSS style directly from the module page. Export the template in a HTML format. Insert the logo store into template. Use conditional statement in the newsletter template. This feature is a very powerful tool because not all users subscribed have the name assigned to their email address. The developers have the possibility to create new variables very easily. 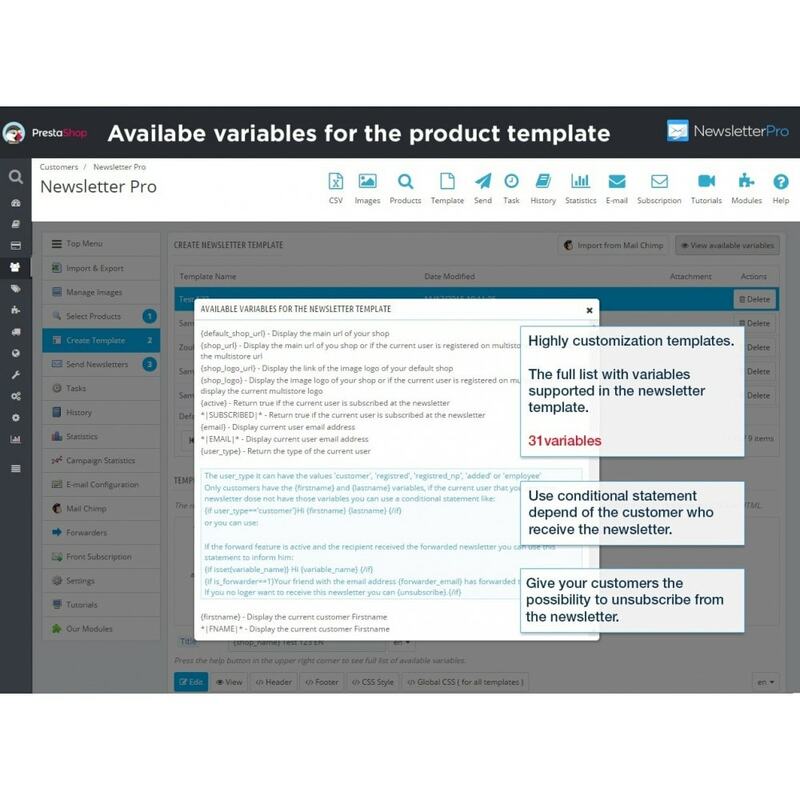 The new variables can be associated with the customer. Allow customers to unsubscribe from the newsletter. 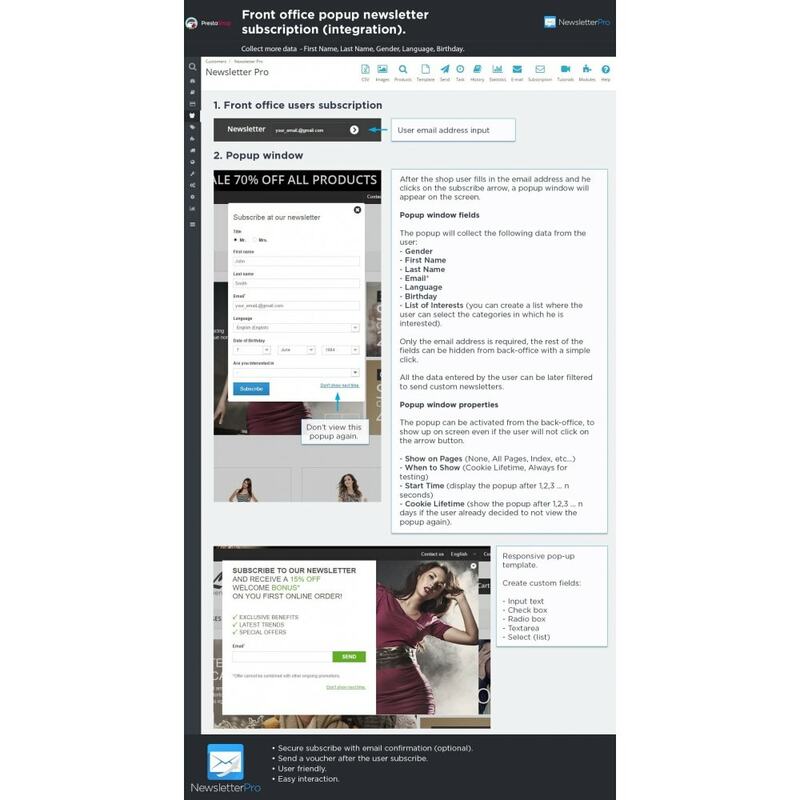 Allow customers to view the newsletter in browser. Add multiple SMTP configurations other than the default prestashop configuration. Add SMTP as Gmail, Mailjet, Mandrill, Yahoo, Hotmail etc. 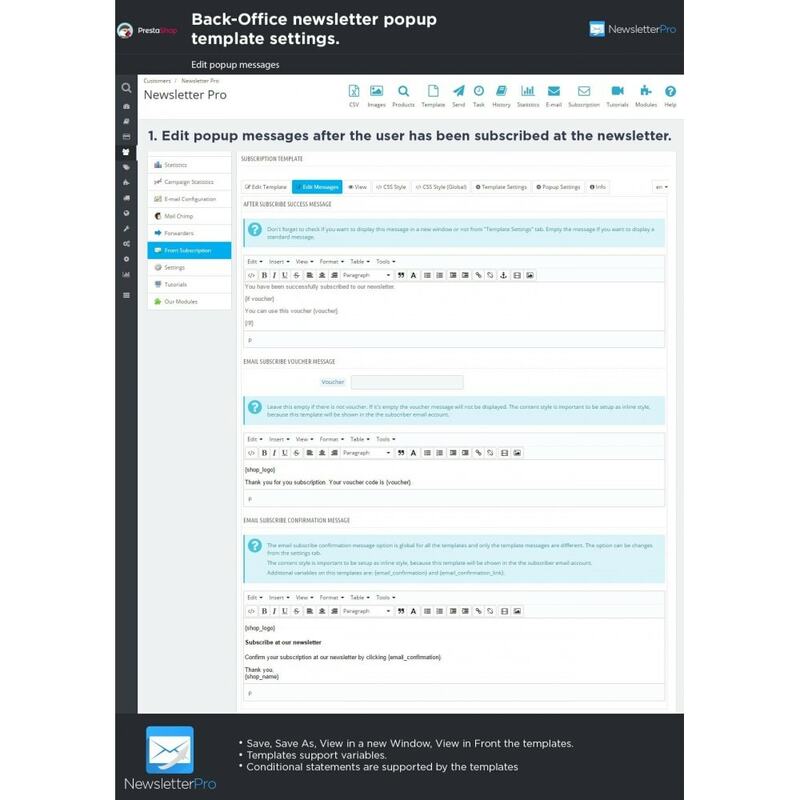 The users can input the email addresses into a field in the shop front-office and a popup window will appear on the screen to proceed the newsletter subscription. The users can fills out the following fields: Gender, First Name, Last Name, E-mail, Language, Birthday, List of interests (you can create a list of interests with different categories from the back-office, then the user will select one or multiple options from the list). Only the email address is required at the newsletter subscription, the rest of the fields can be easily hidden from the user. You can display the newsletter subscription form, even if the users did not clicked on the subscription button. Auto show the popup subscription. 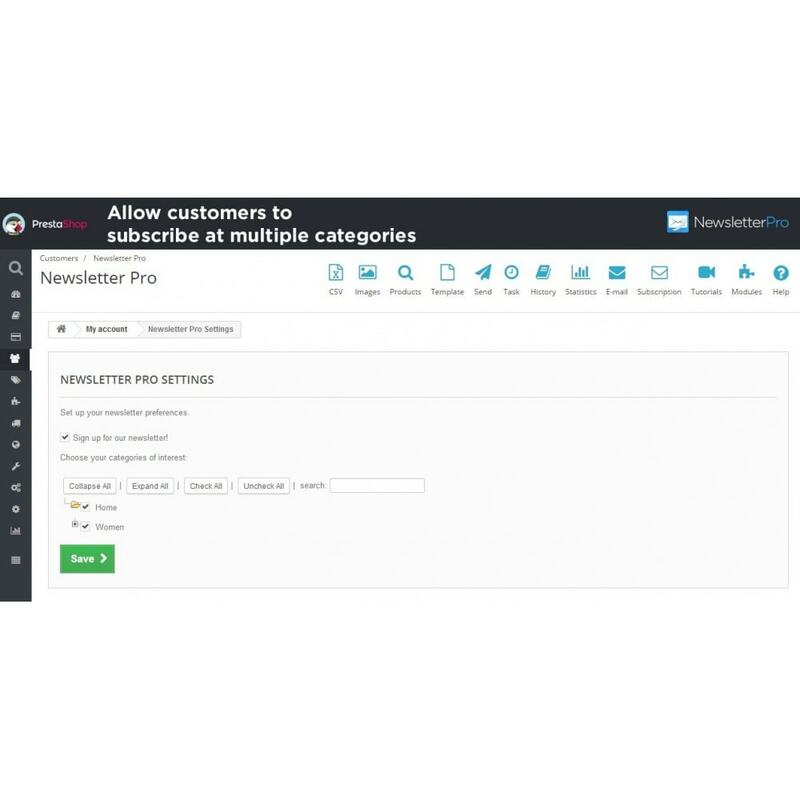 The customer will receive an email confirmation after he has subscribed at the newsletter (this option can be deactivated from the back-office). The customer will receive a voucher after his subscription (this option can be deactivated from the back-office). 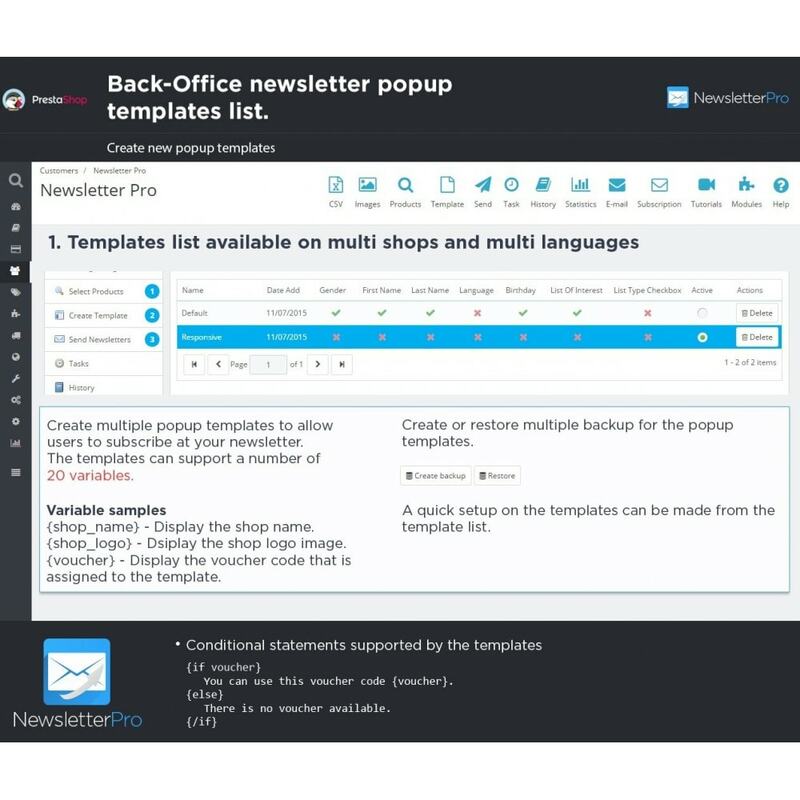 Create multiple popup templates (for the front-office) to allow users to subscribe at your newsletter. 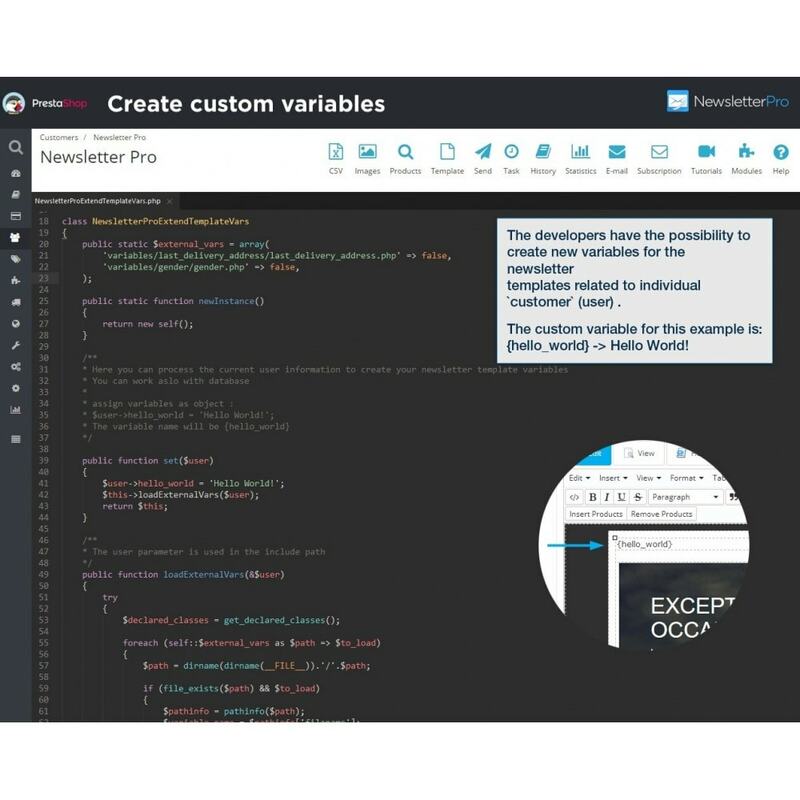 The popup templates support a number of 20 variables. Some of the variables examples are – display the shop name, – display the shop logo, – display the voucher code that is assigned to the template, etc. Conditional statement are allowed by the templates. Create multiple backups for the popup templates. The backups can be restored later. Set the width of the template by using an intuitive slider. The width of the template can be expressed in pixels (px) or in percent (%) depending of your desires. For a responsive template the percent options will fit your needs. Manage the list of interests. 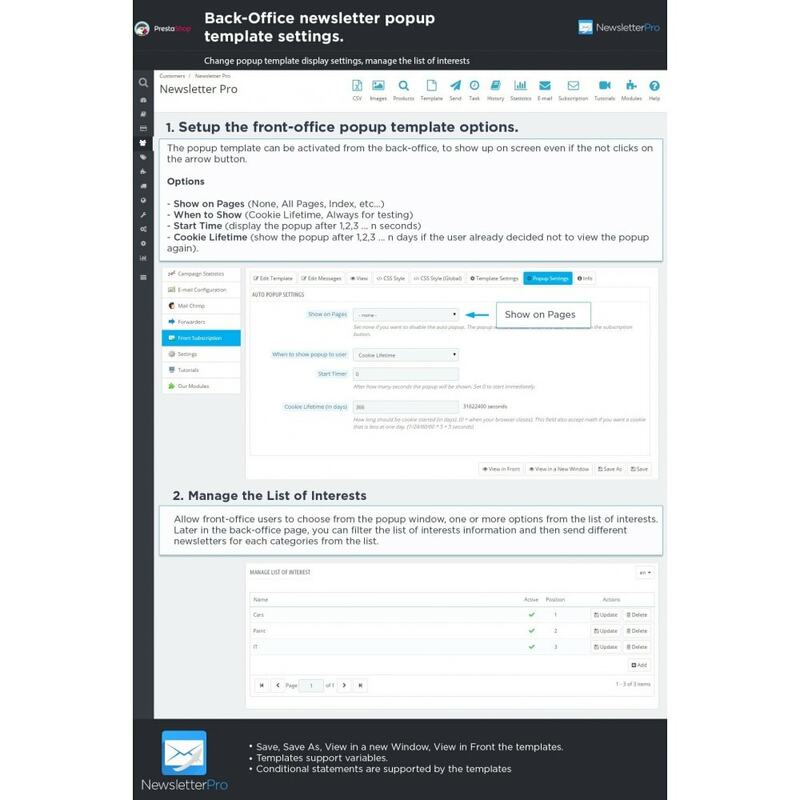 Allow front-office users to choose from the popup window, one or more options from the list of interests. Later in the back-office page you can filter the list of interests information and then send different newsletters for each categories from the list. Manage the auto show popup subscription. Edit three popup messages after the user has been subscribed at your newsletter. 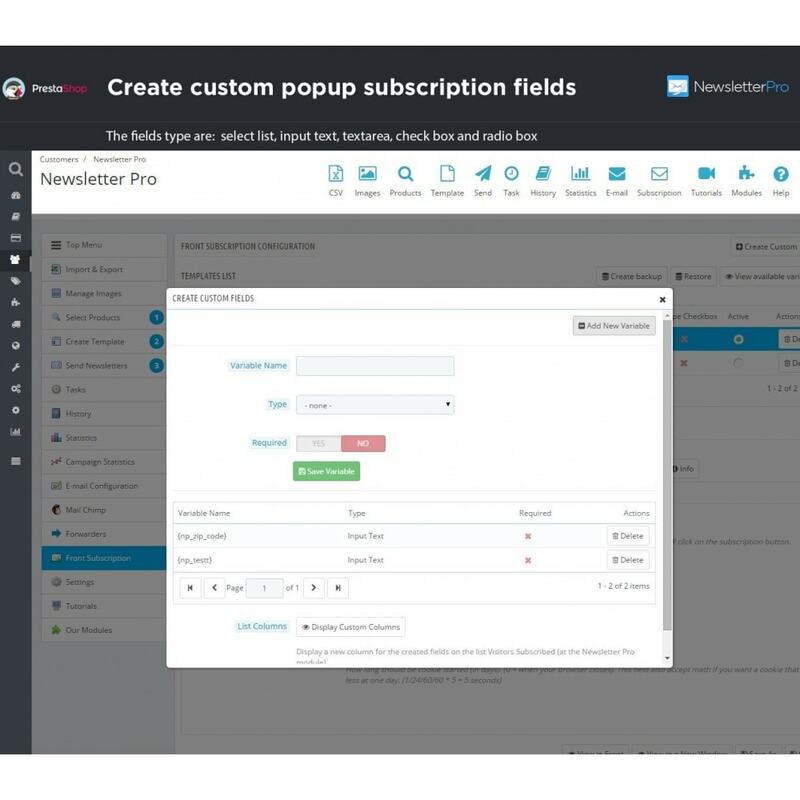 Create custom fields and collect more information about your customers, for the front office newsletter popup subscription. There are four lists with emails available: “Customers”, Visitors (from the module block newsletter subscription),”Visitors” (from the module newsletter pro subscription), “Added” (a personal list with emails). All the lists have available a smart search. Search the recipients by First Name, Last Name, or email address. Filter the recipients by: language, group, store, customer birthday. Filter recipients by a specific product bought. 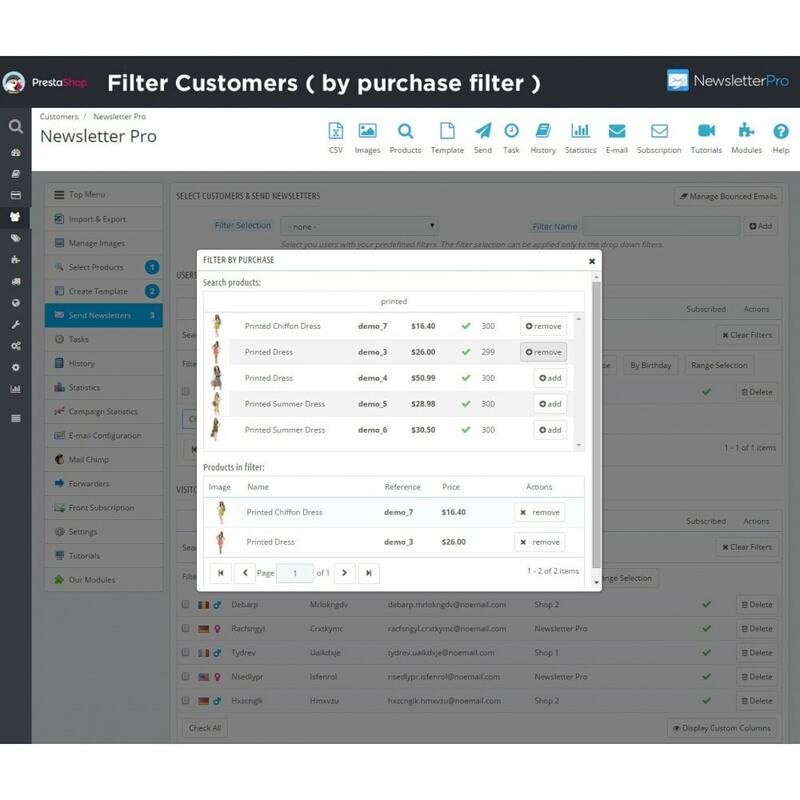 Filter recipients by the customer category of interest. Select the recipients by a specific range (ex: from the customer number 150 to the customer 500). The choice of unique recipients from the email lists. 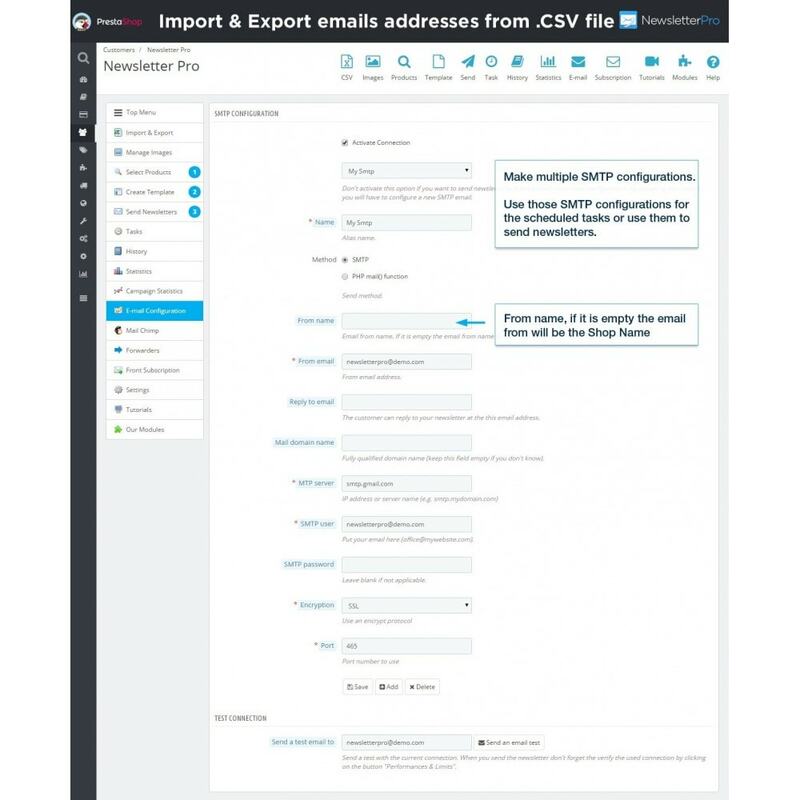 Import email addresses from a CSV file into a personal list with email addresses. The email addresses that are stored in the personal list can be associated with the person First Name, Last Name, shop, language. 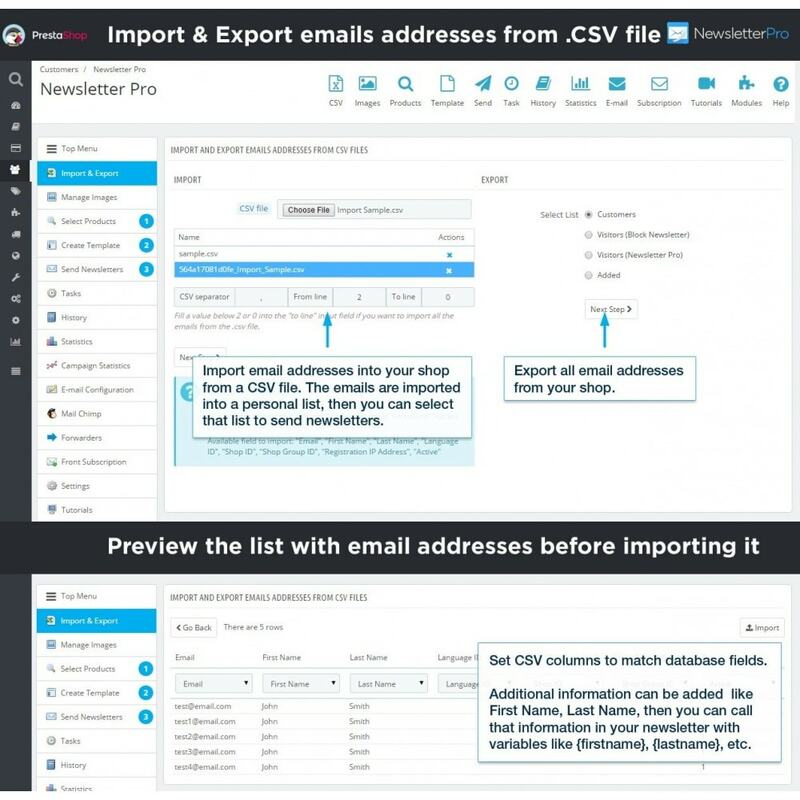 Export all email addresses from the lists to a CSV file. Define a filter selection, for the email addresses lists. 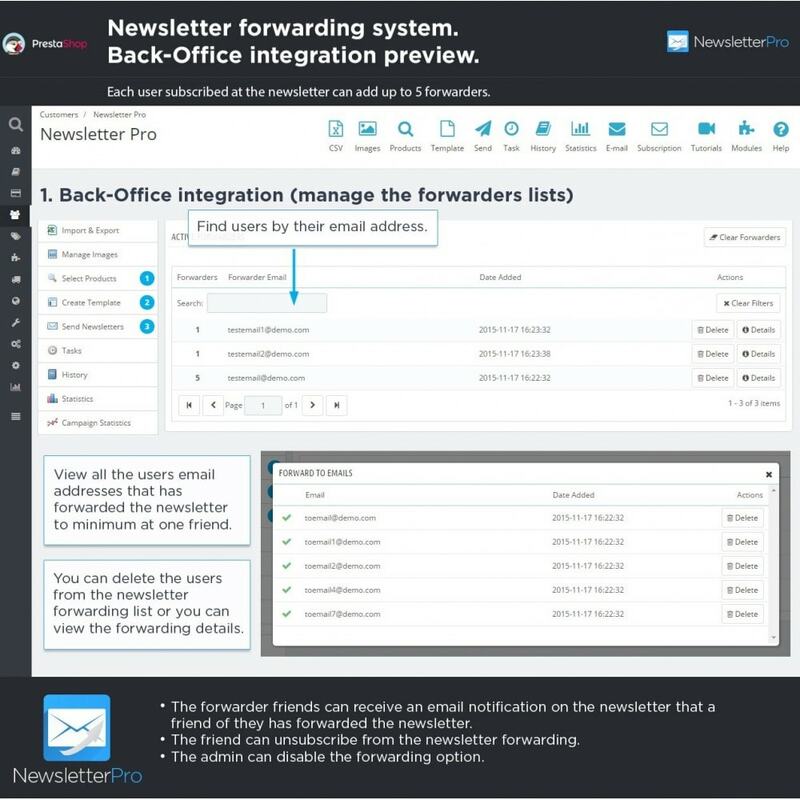 If the newsletter template has the forwarding feature activated, the user can forward the newsletter up to five friends. In the website front office the user can add up to five friends email addresses. The next time when you send the newsletter, the five friends will receive your newsletter. The friends can receive an email notification on the newsletter that will know that a friend of has forwarded the newsletter. The friends can unsubscribe from the newsletter. Disable or enable the forwarding system. View a list with all users email addresses that has forwarded the newsletter. Delete the users from the newsletter forwarding list. 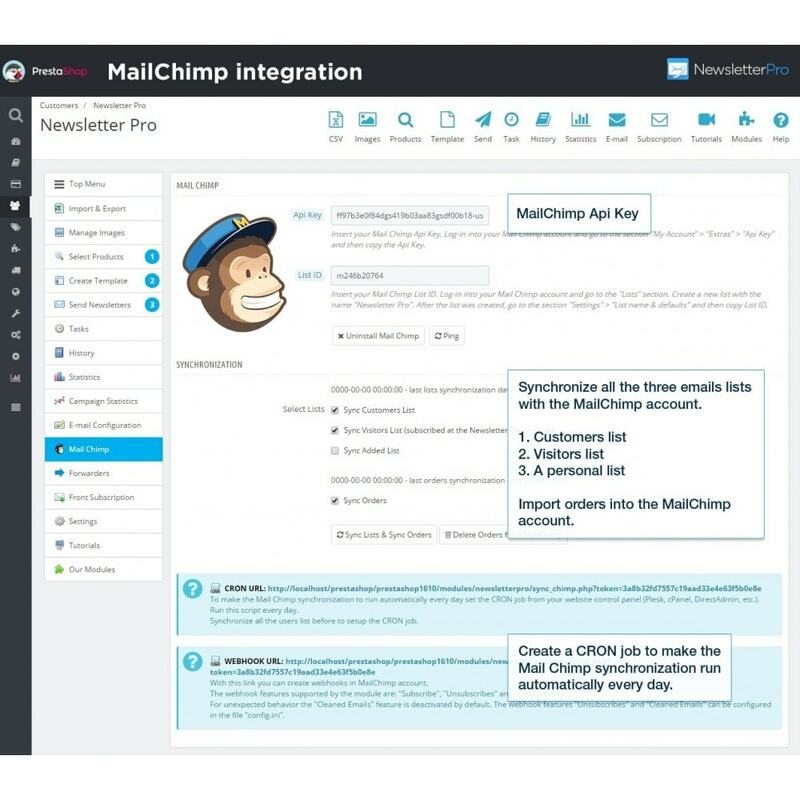 Synchronize customer, visitors, and a personal list with MailChimp. 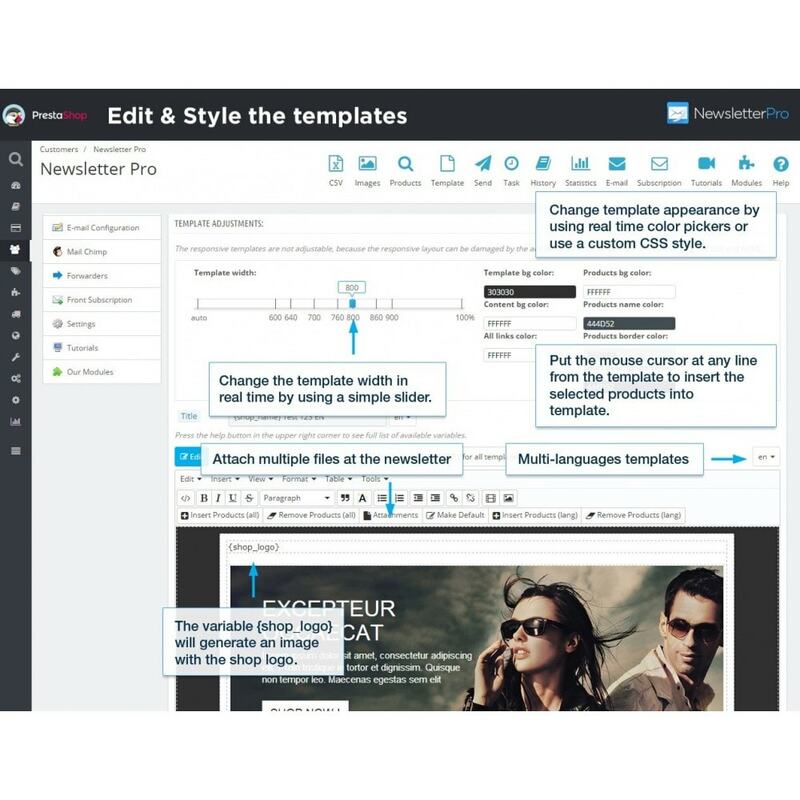 Export the template with products included, into a MailChimp account. Use CRON job to make the MailChimp synchronize to run automatically every day. 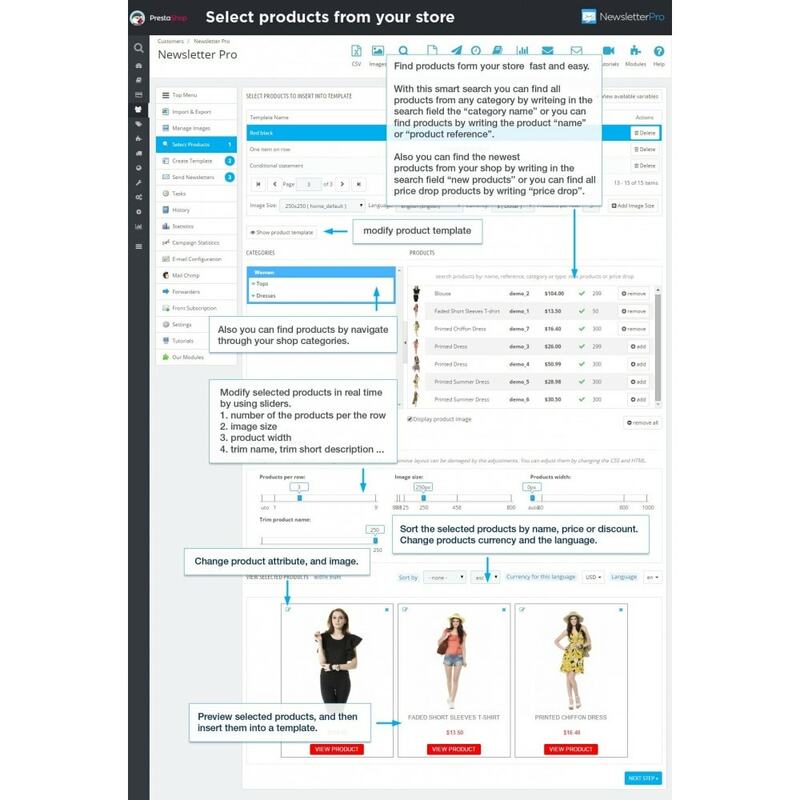 Scale the product images size in real time by using a simple slider. Delete or Upload new images and use them to build a nice template. Resize or not the width of the image when uploading a new one. 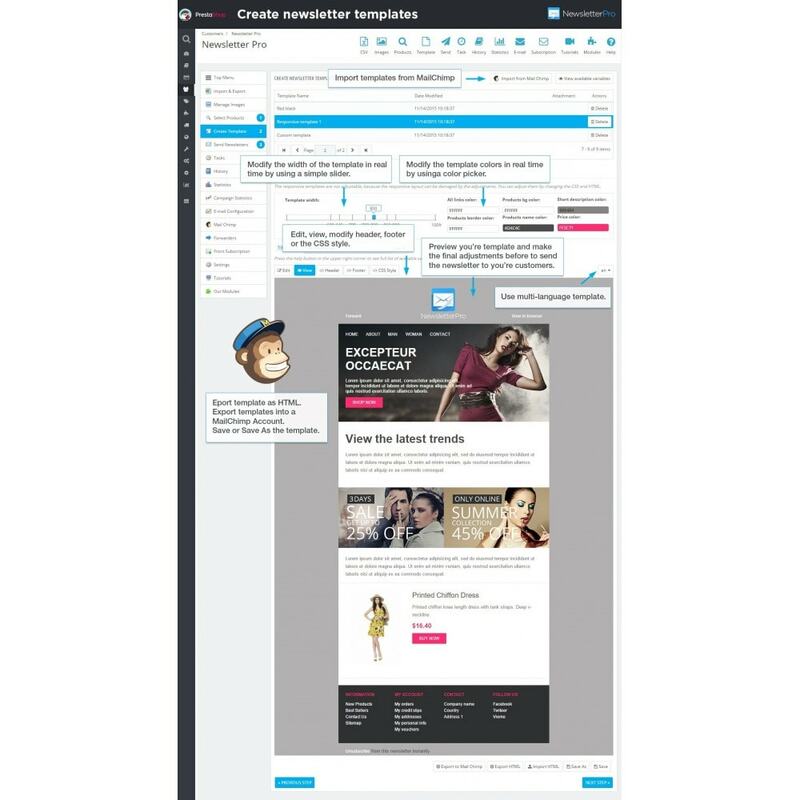 Use your own image size for the products, or select the predefined size of the prestashop system. Embed images into the newsletter. 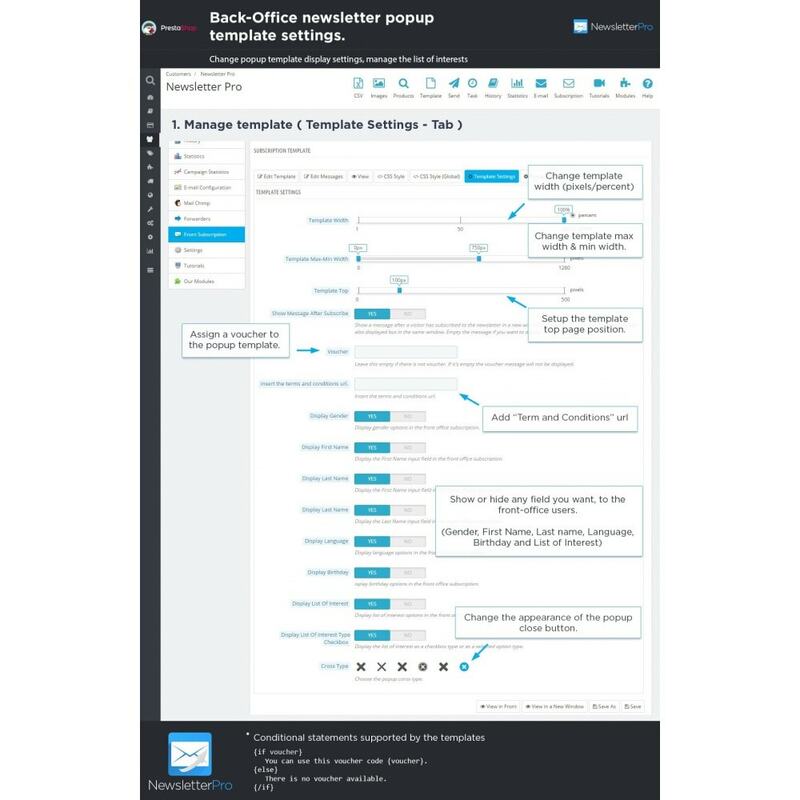 Create tasks schedule with different SMTP configurations and different templates. 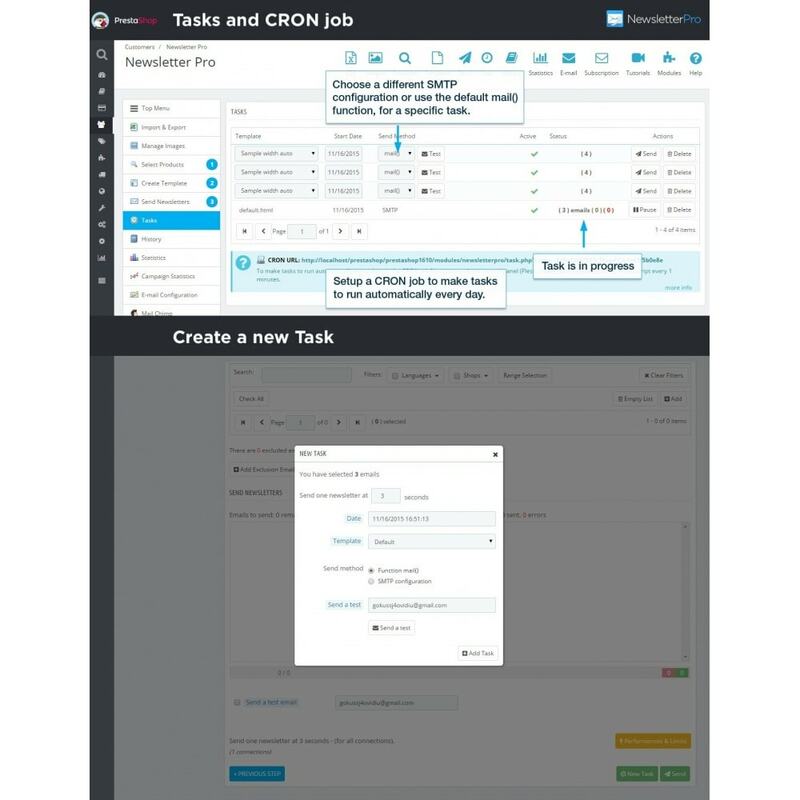 Use CRON job to make tasks to run automatically every day. 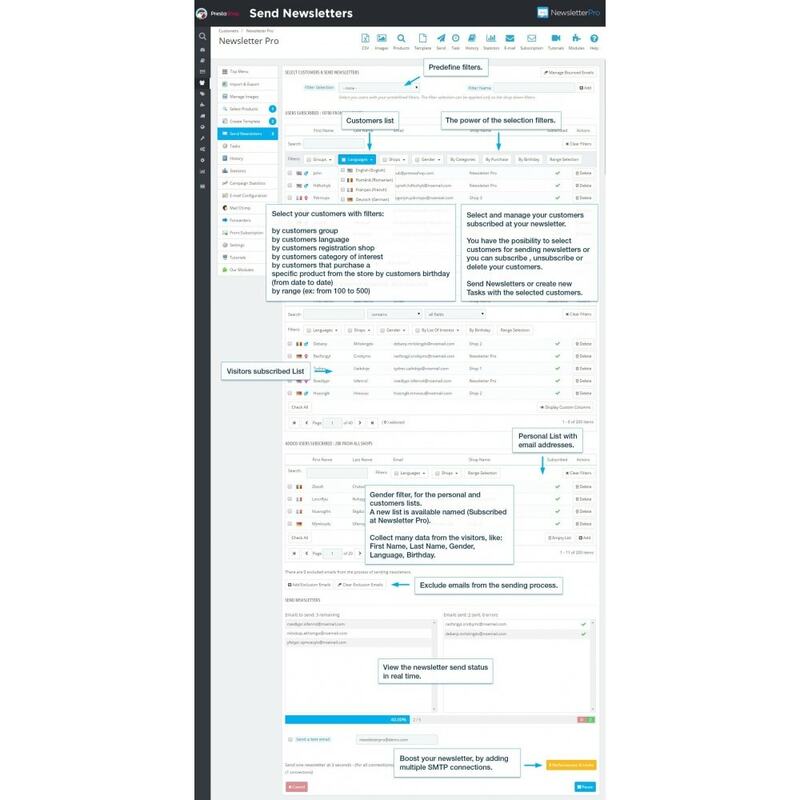 Test the task SMTP connection before send it. Send, Pause or Delete the scheduled tasks. 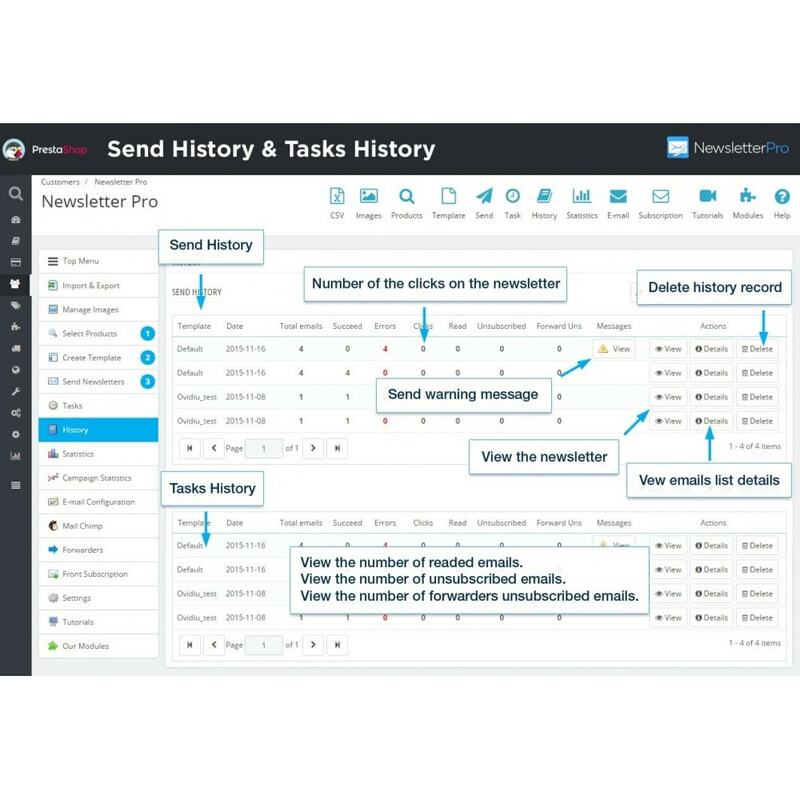 Send multiple tasks in the same time. Show tasks status ( today , tomorrow, in progress - total emails , sent successfully sent errors, view error messages ). Newsletter performances have been improved. Now you can use multiple SMTP connections, for sending newsletters, in the save time. Set a time interval between successive sent emails. Pause option when sending newsletters. Send a test newsletter to your email address. The possibility to clear the newsletter history records. Send the last newsletter to the new customers when they create a new account on the store. Sending newsletters using SMTP via AJAX. No time limit for php scripting (php_execution_time) because of AJAX. See the newsletter statistics in real time. See top 100 clicked products from a newsletter. See how many clicks receive a newsletter. 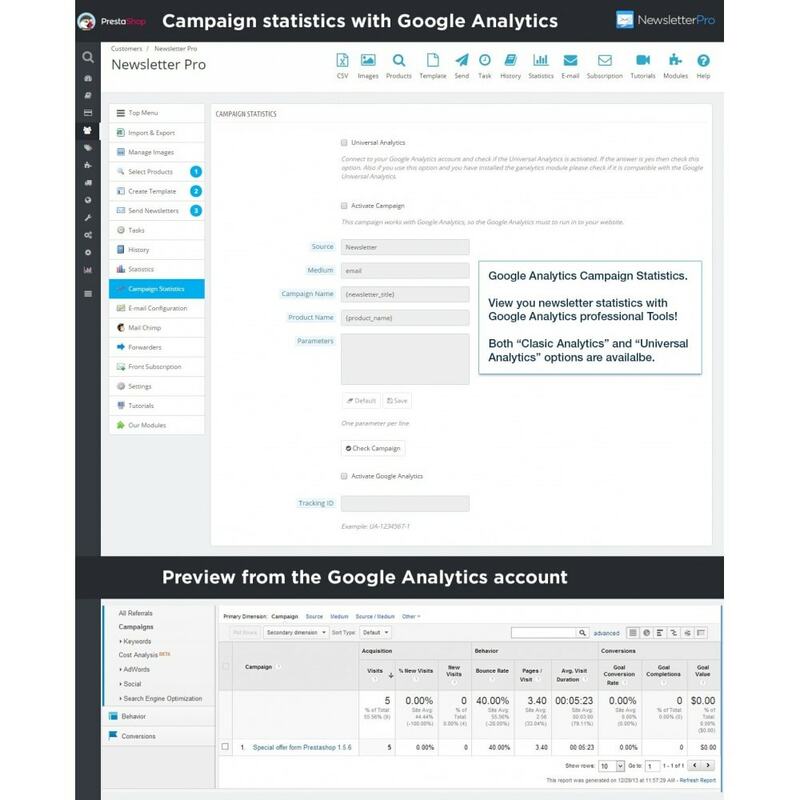 Use the campaign statistics with Google Analytics. This option allow you to view in your Google Analytics account, how many visits you get from the sent newsletters at a professional level. View the history of the newsletters sent. View the history of the tasks sent. View the number of readed emails. View the number of unsubscribed emails. View the number of forwarders unsubscribed emails. View the newsletter template in the history section. View the newsletter sent details ( ex: all sent email address ). Delete one newsletter record from the history. Clear all the records from the history. [Yes, No] Display only subscribed emails. [Yes, No] Send multiple tasks in the same time. [Yes, No] Display only active products that are available for the customer. [Yes, No] Customer subscribe by category. [Yes, No] Send the last newsletter when a client create a new account. [Yes, No] Use pretty url. [Yes, No] The usage of pretty url. [Yes, No] Activate the front option subscription feature. 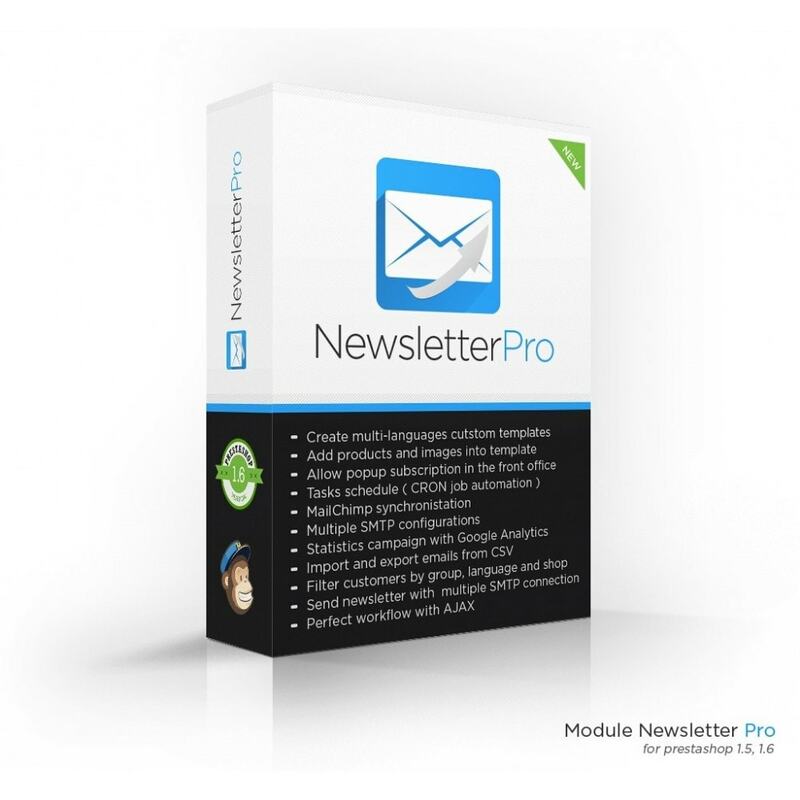 Choose the module subscription option: by block newsletter module or by newsletter pro module. Import all emails from the block newsletter module to the newsletter module. [Yes, No] Secure subscribe (send a confirmation email when a user submitted the subscription request). Clear the emails that did not confirmed the subscription to the newsletter. A log file is available. Create multiple database backups for this module. Create shortcuts to the menu. Most of the features are available in the online video tutorials. You can also view the screenshots to understand all the features available. for Prestashop 1.4.x (module version 1.2.1) - (don't support: tasks, multiple smtp, mailchimp) ask the developer for more details. Very advanced newsletter system that fulfills all our needs. 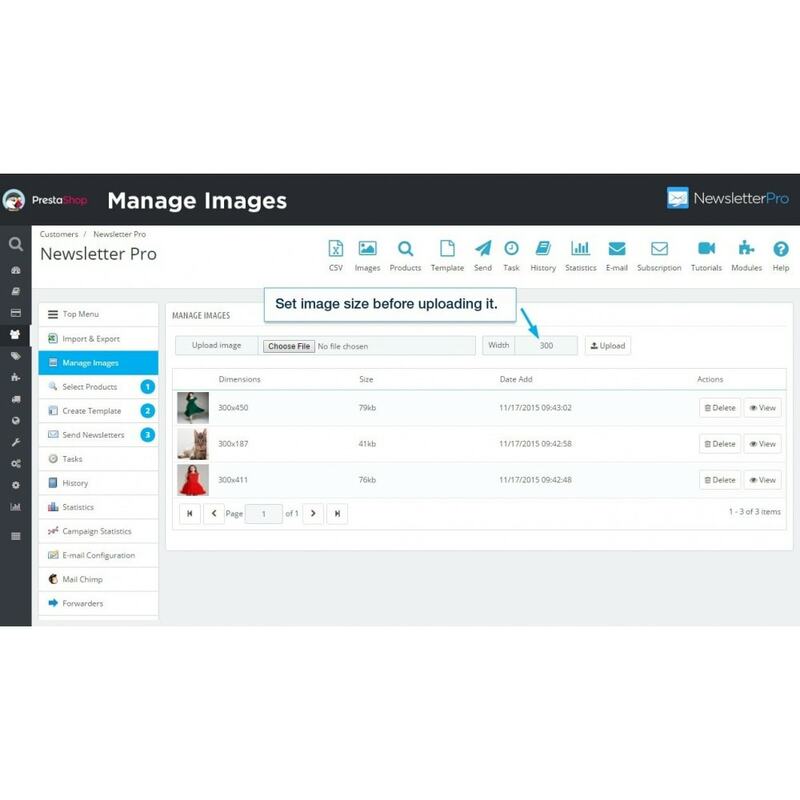 Great integration with MailChimp and easy to set up. It is now much easier to make newsletters than before with MailChimp itself. An installation guide is attached.